Needham's Matt Smith is hoping to lead the Rockets to a 4-0 start. It will be awfully hard for anything to top last week's slate of games, but this weekend's schedule poses some interesting matchups. While some leagues inch closer towards determining a champion, other teams are taking a week off from conference play to go up against top-tier non-league opponents. Editor Joe Parello and myself will have all our picks out for this weekend's top games out tomorrow, but until then here are our top five matchups to watch in week five. When it comes to Patriot League Keenan champions over the last 10 years, it does not take long to rattle off the list. Name 'Duxbury' and you have said all that's needed to be said. If there is a team that is poised to change that, its this year's Hingham group and they'll get their chance when they travel to Duxbury on Friday night. While the Dragons offense received a majority of the recognition in the early going, its been the defense that has done the heavy lifting as of late. The Dragons have surrendered just 15 points combined over the last two weeks in order to remain perfect in league play. Quinn Murphy leads the line play, while John Roberts captains an offense that includes highly touted play makers Will Prouty, and Tim Landolfi. Hingham's chances took a hit when they lost starting quarterback Jack Johnson two weeks ago, but the Harbormen still hold the pieces to dethrone the Dragons. Six-foot-seven Spencer Cassell is one of the more imposing players on both sides of the ball, serving as a mismatch nightmare in the passing game as well as up front. Kevin Shea handles most of the work load of the backfield while Jonathan Bearden provides versatility. This may all come down to the play of Owen O'Brien; the man filling in for the injured Johnson. With Duxbury likely to pack the box, and prevent the Harbormen from developing a running game, O'Brien's ability to keep the Dragons honest through the air will be pivotal. As St. John's Prep and Catholic Memorial try to position themselves for the postseason, its hard to underestimate the importance of this game for both teams. The Eagles are jockeying for a top-two spot, and with Acton-Boxboro taking down Lincoln-Sudbury last Friday, they are in need of a win over a highly-ranked team. Throughout the early part of the season they have shown the ability to compete with anybody with the Eagles lone loss coming on the road to No. 1 Everett. Matt Crowley, Aise Pream, and Wes Rockett are the focal points of an offense that has scored a combined 128 points through four games. Catholic Memorial is trying to shake off a tough overtime loss, and will once again rely on a stingy defense to get the job done. Owen McGowan, Luke Folan, and Khari Johnson highlight the premiere unit, with McGowan also a threat on offense. Hunter Tully has emerged as a number-one option in the Knights' passing game. In a game that is likely to go down to the closing minutes, Johnson and the Knights special teams could well be the difference. To say both these teams have had this game circled since the start of camp would be a massive understatement. While No. 25 St. John's is the defending Div. 3 Super Bowl champs, No. 11 Shrewsbury has been the talk of the town in the early going. The Colonials have proven that the preseason hype was well deserved. Quarterback Drew Camapale's talents are well documented, but its been the play of senior running back and defensive back Jon White that has been the difference for the Colonials offense through the first four weeks. After scuffling in the early gong, St. John's may have hit its stride in the second half on Saturday versus Wachusett. Jay Brunelle is a nightmare for opposing defensive backs and Eamonn Dennis' speed speaks for itself. Colin Schofield had his best performance to date in the Pioneers' comeback against the Mountaineers, and Colin Deso is a big x-factor. In an environment that is sure to be centered around a frantic and electric Pioneers' home crowd, look for the first 11 minutes of this game to play an important deciding factor. If there is a team that has officially arrived in the Bay State its No. 10 Needham. The Rockets have blitzed the competition in the early going, as after holding on for a 20-16 win over Natick in week one, they have outscored their next three opponents by a combined score of 108-20. 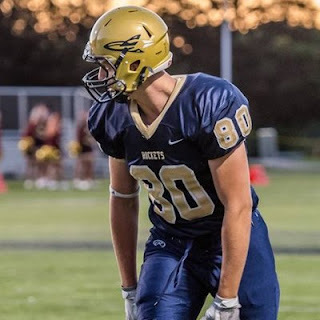 Its become 'pick your poison' for opposing defenses going against Needham, with star tight end/wide receiver Matt Smith often attracting multiple defenders while Tyler Reid and Alex Child have emerged as threats out of the backfield. Quarterback Charlie Ogletree, meanwhile, is not to be taken lightly. Braintree, however, poses its own unique challenge to the Rockets due in large part to its physicality, play up front, and the capabilities of do-it-all star Billy Silvia. The Wamps, to boot, are coming off their first loss to the season to Natick and face a near do-or-die game if they hope to secure a top four seed in Div. 2 South. When Silvia is not in the fold, quarterback Michael Tellier and wideout Calvin Lane are usually the linchpins to the Braintree offense. In what is likely to be a low-scoring game, Braintree's defense will be the difference if they hope to keep this road battle within striking distance heading into the late stages. Two weeks ago, this game did not seem all that intriguing - outside of perhaps the name on the front of the jerseys. But following the Eagles surprise road upset of Brockton in week four, 21-13, this matchup takes on a bit of a different feeling. Eagles' sophomore quarterback Bobby Wiesenhan, filling in due to an injury, turned in a solid performance in his first career start while running back Brendan Cassamajor continued his promising start to the season. Even though BC High has struggled offensively at times over the course of the first four games of the season, its defense by and large has stood tall. Behind tackle Keith Henderson, linebacker John DeStefanis, and defensive back Kaleb Moody the Eagles have allowed just 46 points through their first four games. It goes without saying that this same Eagles' defense will be in for a far taller task than anything its experienced to date when the Crimson Tide take James Cotter Field. Mike Sainristil is unlike any play maker in the Bay State and Isaac Seide's physicality - on top of his speed - cannot be underestimated. Sophomore quarterback Duke Doherty has made weekly strides, and Robby Riobe has proven to be ball-hawk in the secondary. Sophomore Carter Rice has proven to be an energizer of sorts for BC High's offense - breaking free both on special teams and out of the passing game. If the Eagles have any hopes of being the first team to upend No. 1 Everett, Rice will have to fill up the stat sheet.